This was a pretty lack-luster week. National currencies, bonds and commodities were mixed, while cryptocurrencies and most equities were sharply lower. The largest gains were in coffee, up just 0.9%. The largest losses were in Ethereum, which fell 23% this week, leaving it down 46% in the last month. The US Dollar rose more than any other national currency, gaining 0.3%. The Canadian Dollar was weakest, falling 0.6%. Short term bonds rose 0.2%, while long term bonds fell 1.9%. Bitcoin rose early in the week, closing at 192.3 grams on Tuesday, then fell to finish the week at 167.8 grams, off 7.8%. Ethereum also started the week on a rising note, but was hit hard on Wednesday and Friday, and ended the week down 23%. The Dow Jones Industrials where the only stocks in the black this week, and then, only by 0.1%. Gold stocks took the worst beating, as the HUI fell 4.6% to close at 3.53 grams. Next weakest was the Euro STOXX 50, off 3.2%. Silver dropped 2.9% this week, the largest of the commodity losses. Crude oil wasn't far behind, though, falling 2.6%. Coffee was the strongest commodity, gaining 0.9%. Platinum made a series of new all-time lows this week, closing at 20.117 grams per ounce on Wednesday, before rallying slightly to close the week at 20.132 grams, down 1.7%. This week national currencies were lower, while other asset classes were mixed. The largest gains were in palladium, up 4.6%, and Bitcoin, which rose 4.3%. Coffee, off 3.2%, and gold stocks, down 2.8%, saw the largest losses. National currencies were all lower, led by the Chinese Yuan which closed down 0.5%. The Japanese Yen fell the least, dropping just 0.1%. The US and Canadian Dollars each fell 0.4%. SHY, the short term bond fund, also dropped 0.4%, while TLT, the long term bond fund, fell 0.6%. Bitcoin worked its way higher throughout the week, closing near its weekly high at 182 grams, up 4.3%. It has continued to rise since, closing Tuesday at 192.3 grams. Ethereum has oscillated between 7.1 grams and 7.6 grams, but ended the week at 7.3 grams, off 0.4%. As of Tuesday, it was trading at 7.5 grams. Japanese shares gained more than any other equities as the Nikkei rose 1.1%. Gold stocks were the worst performers: the HUI fell 2.8%. The European STOXX were also hit hard, dropping 2.8%. The S&P 500 rose 0.5%. The commodities sector had both the largest gains (palladium, up 4.6%) and the largest losses (coffee, down 3.2%) among all asset classes. Copper fell 2.2%, while crude oil gained 1.2%. Silver was little changed, down 0.2%. Platinum was up 0.4%, but still hovers just above its all-time lows. Bonds and national currencies were lower, with the exception of the Euro, which managed a 0.3% rise. Other asset classes were mixed. Crude oil and Palladium rose the most, gaining 2.6% and 2.5% respectively. Ethereum had the largest losses, falling 11.8%. Bitcoin fell early in the week from 173.7 grams to 165.7 grams, then worked its way higher to close at 174.5 grams, up 0.5%. Ethereum began the week at 8.3 grams and dropped to a low of 7.1 grams on Wednesday, then recovered to close at 7.3 grams, 11.8% lower for the week. Many other major cryptos did even worse; for instance DASH lost 14.5% for the week. Among the equities, European stocks were the star performers, rising 1.5%. Gold stocks also did well, gaining 1.4%. The Dow Industrials were the worst performers, giving up 1.1%. Crude oil and palladium gained 2.6% and 2.5% respectively, outpacing all other assets. Silver had the largest decline of any commodity, dropping 1.9%. Platinum finished the week at 20.4 grams per ounce, down 0.7%, and just 0.1% above its all-time low. National currencies, bonds, and major stock indexes were higher, while cryptocurrencies and commodities were mixed. The largest gain was in Bitcoin, which rose 9.7% while most other major cryptos were falling. Gold stocks fell 8.2%, the largest drop for any asset class, and the only equity to close lower. The Japanese Yen was once again the strongest currency, adding 3.3%. The Chinese Yuan was the weakest, gaining 2.1%. US Dollar cash and short term bonds rose 3.1% apiece, while TLT, the 20+ Year bond fund gained 3.3%. Bitcoin worked its way higher all through the week, ending up 9.7%. Ethereum fell hard early in the week, losing 13.3% by Tuesday, then rallying to finish the week down 2.6% at 8.3 grams. Bitcoin was much stronger than other major cryptos, as well. For instance, DASH dropped 8.0% for the week, following a similar pattern to ETH. Speculation has it that those concerned with a contagion of Turkish financial problems and/or a coming Yuan devaluation are using Bitcoin as a safe haven vehicle. Gold stocks, as measured by the HUI, fell 8.2%, trading more in line with commodities than with the other equities. The Dow industrials led the major indexes higher, rising 4.5%. The Euro STOXX trailed behind, gaining 2.0%. The only rising commodities were palladium, up 1.2%, and crude oil, up 0.4%. The largest losses were in platinum and coffee, off 3.0% and 2.5% respectively. Silver ended the week down 1.7%, and copper was lower by 1.0%. 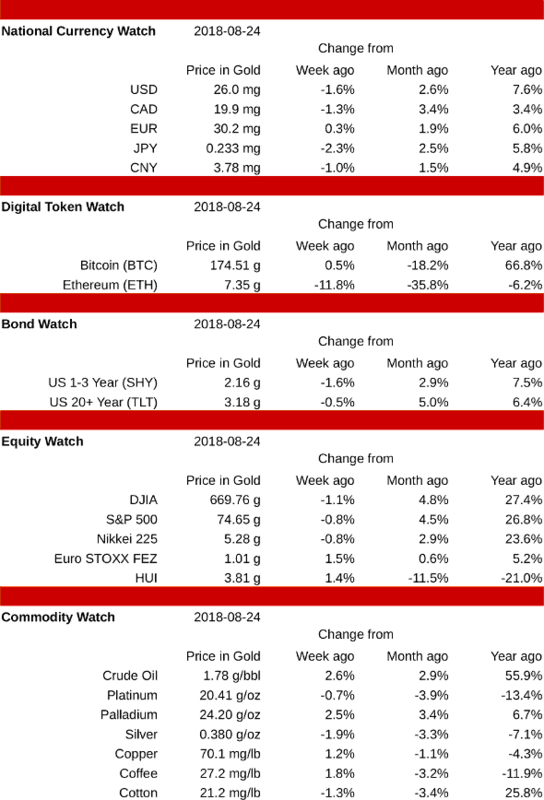 Cryptocurrencies, stocks, and most commodities were lower, bonds were higher, and national currencies were mixed. Cryptos continued their fall, with Ethereum dropping 20.0% while Bitcoin gave up 16.7%. Long term bonds rose 1.4%, the largest gain this week. The only rising commodity was silver, which added 0.3%. The Japanese Yen was the strongest currency, adding 0.6%. The Euro was the weakest, falling 1.2%. The US Dollar added 0.2%, but was outpaced by its bonds, as the short term SHY gained 0.3% and the long term TLT rose 1.4%. The cryptocurrencies were hit hard again this week, as Ethereum fell 20.0% to close at 8.6 grams and Bitcoin slid 16.7% to close at 158.4 grams. Over the weekend, Bitcoin began to rise, but Ethereum continued to slide lower. This week's drop has been attributed to the SEC postponing a ruling on VanEck's Bitcoin ETF proposal until the end of September. The European STOXX 50 led equities lower, falling 3.2%. Gold stocks declined 2.7%. The S&P 500 fell the least, losing 0.4%. Silver rose 0.3% this week, but all other commodities were lower. Cotton declined 3.1% and crude oil fell 1.1%. Palladium fell 0.8% and copper was down 0.6%. Currencies and bonds were higher, stocks and commodities were mixed. Cryptocurrencies were hit hard, as Ethereum fell 10.4% and Bitcoin dropped 8.4%. The largest gains were in the S&P 500 stock index which rose 1.4%. The Canadian Dollar led the currencies higher, gaining 1.2%. The Euro gained the least, adding 0.1%. USD cash rose 0.6% and long and short term treasury bonds each rose 0.7%. Ethereum fell slowly at first, then accelerated on Tuesday and Wednesday, hitting a low of 10.4 grams on Thursday. It recovered slightly to close the week at 10.7 grams, down 10.4%. Bitcoin rose a bit on the weekend hitting a high of 208.9 grams, then started dropping each day, ending the week at 190.1 grams, off 8.4%. Since the close, Bitcoin has fallen faster than Ethereum, and as of Monday, Bitcoin was down another 5% while Ethereum was off about 2%. Other cryptocurrencies generally fared worse than BTC and ETH; for instance, DASH was down 12.9% for the week. US stocks were higher, with the S&P 500 gaining 1.4% and the Dow Jones Industrials rising 0.7%, while the European STOXX 50 index fell 0.7%. Gold stocks were unchanged. Platinum and silver rose 1.0% and 0.7% respectively, while copper and palladium dropped 0.9% and 0.5%. Coffee had the largest drop of any commodity, falling 1.8%. Crude oil rose 0.3%. Currencies and equities were higher this week, while bonds and commodities were mixed. Bitcoin and Ethereum were the largest gainers, rising 19.1% and 4.9% respectively. The largest drops were in palladium, down 4.5%, and silver, off 1.8%. The strongest government-issued currency was the Japanese Yen, which gained 1.6%. The Chinese Yuan was weakest, adding 0.4%. Short term bonds and USD cash rose 1.1% each, while long term bonds fell 0.6%. Bitcoin rose through the week, peaking at 190.7 grams on Thursday before pulling back to finish the week at 186.1 grams, up 19.1%. Ethereum followed a similar pattern, but peaked on Tuesday at 12.6 grams, then worked lower to close at 11.4 grams, for a gain of 4.9%. Stock indexes were all higher, led by the Japanese Nikkei, which gained 2.0%. The HUI gold stocks rose the least, adding 0.2%. The Dow Industrials gained 1.2%. Metals were mixed, with palladium and silver falling 4.5% and 1.8% respectively, while copper and platinum rose 0.2% apiece. Coffee gained more than any other commodity, adding 1.7%. Currencies, bonds and stocks were mostly higher, while crypto-currencies got hammered, and commodities were mixed. The largest gains were in cotton, up 5.2%, and the Dow Jones Industrial Average, up 3.6%. The biggest losses were in Ethereum, which fell 7.4%. The only falling government-issued currency was the Japanese Yen, which lost 0.7%. The USD was strongest, gaining 1.1%. Long and short term bonds both kept pace with USD cash, also rising 1.1%. Bitcoin and Ethereum both worked their way lower over the course of the week, closing down 5.5% and 7.4% respectively. On Monday the 16th, however, both made solid gains, wiping out the prior week's losses. Gold stocks fell 2.1%, but all other equity indexes were in the black. The Dow led the field, rising 3.4%. The Nikkei was also strong, gaining 3.0%. Commodities were mixed, with cotton rising 5.0% while crude oil fell 2.7% and coffee dropped 2.6%. Among the metals, copper fell 0.4% while palladium rose 0.8%. Silver was little changed, down 0.1%. This was a solid week for cryptocurrencies; commodities were mostly lower, and all other asset classes were mixed. Ethereum topped the charts, rising 8.3%. Copper suffered the largest losses, falling 5.0%. Platinum fell to a new all-time low before recovering to close the week down 1.9%. Currencies were generally weak, although the Canadian Dollar was unchanged and the Euro rose 0.3%. Weakest was the Chinese Yuan, which gave up 0.7%. Bonds were mixed, with short-term SHY falling 0.5% and the long-term TLT rising 0.5%. USD cash was off 0.4%. Bitcoin worked its way higher over the course of the week, finishing up 6.9% at 165.4 grams. Ethereum hit a high of 11.85 grams on Monday, dropped sharply on Tuesday, and recovered for the rest of the week, ending up 8.3% at 11.75 grams. Equities were mostly higher, but the Japanese Nikkei fell 2.4%. The Euro STOXX50 gained 2.2%. Gold stocks rose 2.3%. The only rising commodity was cotton, up 0.2%. Copper was hit hard, falling 5.0%. Platinum hit a new all-time low of 20.66 grams on Tuesday, but recovered to end the week at 20.76 grams, off 1.9%. This was a generally positive week for currencies and bonds, a quiet week for stocks, and a mixed week for cryptocurrencies and commodities. The largest gains were in crude oil, which rose a stunning 9.7%. The largest losses were in Ethereum, which fell 5.0%. The Canadian Dollar was the strongest national currency, gaining 2.9%, while the Euro was in second place, up 1.8%. The only falling currency was the Chinese Yuan, off 0.3%. Bonds rose strongly, and in proportion to their maturity dates. The 20+ year TLT gained 2.5%, while the 2-3 year SHY added 1.6%. Zero maturity USD cash was up 1.5%. Bitcoin rose slowly until Thursday, when it fell hard, recovering on Friday to a new high for the week, up 3.7%. It has continued to rise over the weekend as well, and was about 6% higher on Monday than the close on Friday. Ethereum worked its way lower over the course of the week, and recovered a bit on Friday, but not enough to avoid posting a 5.0% loss. Since the close, however, it has rallied strongly, gaining about 9%, more than making up for the week's losses. Not much action in the Equity markets, as US and European indexes close up 0.2%, while the Japanese Nikkei closes down 0.3%. Gold stocks were little changed, up 0.1%. Crude oil was the strongest asset overall, rising 9.7%, apparently due to OPEC production cuts – in spite of the largest Saudi production boost in five years. Metals were mostly lower, with silver and copper down 1.2% each. Palladium was the exception, gaining 1.2%. Platinum finished the week at 21.17 grams, down 0.4%, just 0.02% above its all time low.